Once again a big thank you to the people linking up to Family Bakes And Makes, I’m loving the ideas you all have and the photos are stunning! As summer comes and goes with patches of rain I’m torn between making light sunshiney bakes or warm comforting ones. Luckily this week we have a mix of both to enjoy. First to link up was Eileen from ET Speaks From Home, she’s made Chocolate chunk cookies using a recipe from a cookbook called 150 Fast and Simple Recipes – it sounds like just my kind of book! 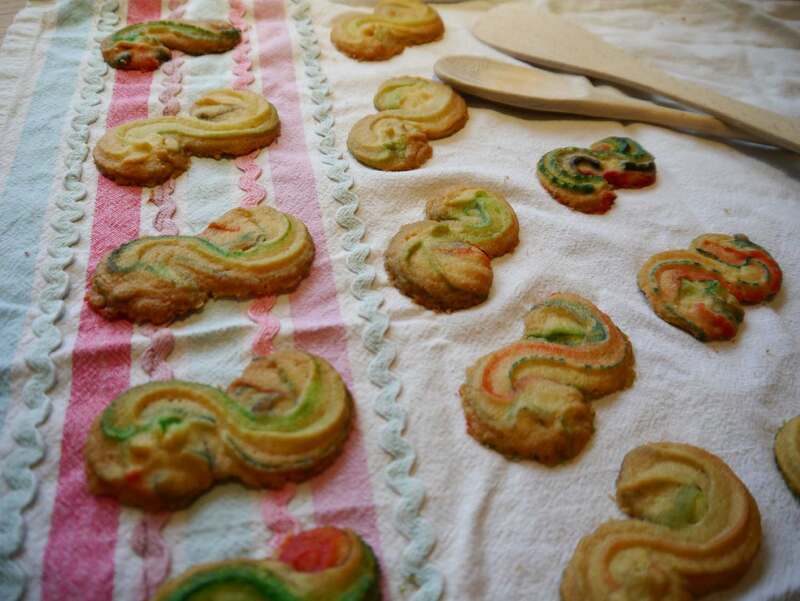 Next are the Rainbow Viennese Biscuits that I whipped up quickly for my kids this week, even with the rainbow colours they were ready in half an hour and are always a favourite even without the traditional chocolate coating. Winnie from Something Sweet has linked two recipes this week, the first are another version of Chocolate chip cookies but this time with the addition of cream cheese, something that I always find very versatile in baking. Winnie’s second entry is for potato -flour blondies they look so moist and delicious and are making me want to go and bake their cousins – brownies. Finally Kerene from The Dream BAker has been using up the egg yolks her husband refuses to eat in these beautifully risen profiteroles filled with a chocolate creme patissiere. If you’ve baked or made something tasty this week please join in below and have a look at the other recipes.